I get a quiet satisfaction out of using up every last scrap of an ingredient. There is nothing worse as a baker than throwing eggs in the compost bin or pouring cottage cheese milk down the drain. Ambient foodstuffs like flour and sugar can last a lifetime (or until my next baking project) but there are so many odds and ends that can turn quicker than it takes to make a batch of scones. It’s a frustrating fact of life. I mused over this for a while, and came up with the idea of Frugal February. Dedicated to making the most of surplus ingredients and showing you how to store all those odds and ends, it’s the perfect way to keep your bank balance intact, your fridge clear of opened and unused cartons and more egg yolks than you can deal with. But equally, it’s about using these things to the best of your ability; lest you end up with a tetris of food parcels in your freezer that you have no idea how to use. I hope that for the next month, I can help you get rid of those little bits and pieces to turn them into delicious treats without throwing anything away. I thought I would first turn my attention to buttermilk. Although you can make your own by souring regular milk with lemon, I buy almond milk for my morning breakfast so never have it in the fridge. But by buying a carton, you inevitably end up with around 100ml that will have you scouring the internet for a use-it-up recipe. I’ll save you the bother – it’s rather difficult. After baking my favourite chocolate fudge cake for my friend Andy who parted for London a few weeks ago, I had around half a carton of buttermilk to use and some dates from my no-bake brownies. 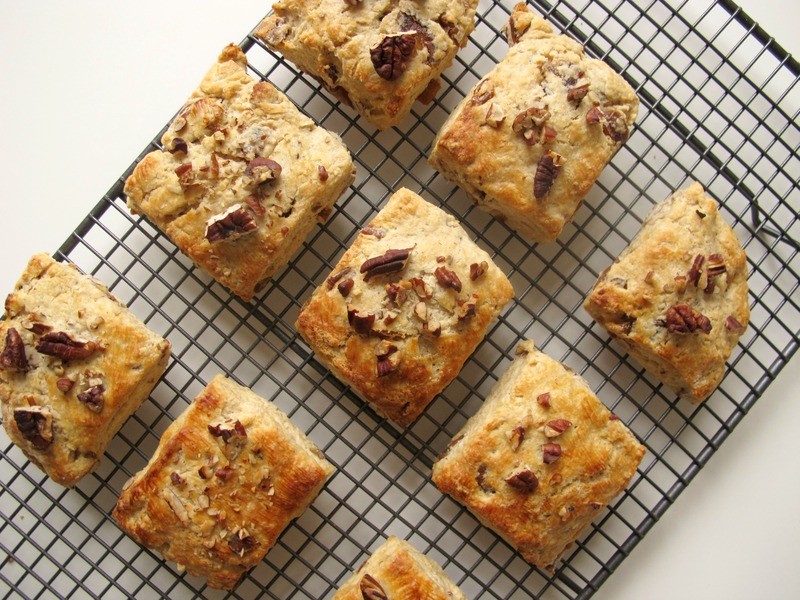 Thus, the first Frugal February recipe was born – Date and Pecan Buttermilk Scones. This is back to basics baking. The kind you can do in your pyjamas, without your contact lenses in and sporting a top knot on a lazy Sunday morning. Butter is fed through fingertips to resemble breadcrumbs, then sugar and spice and all things nice (namely dates and pecans) are added to the mix. Stir with your hands – it’s a Sunday after all. 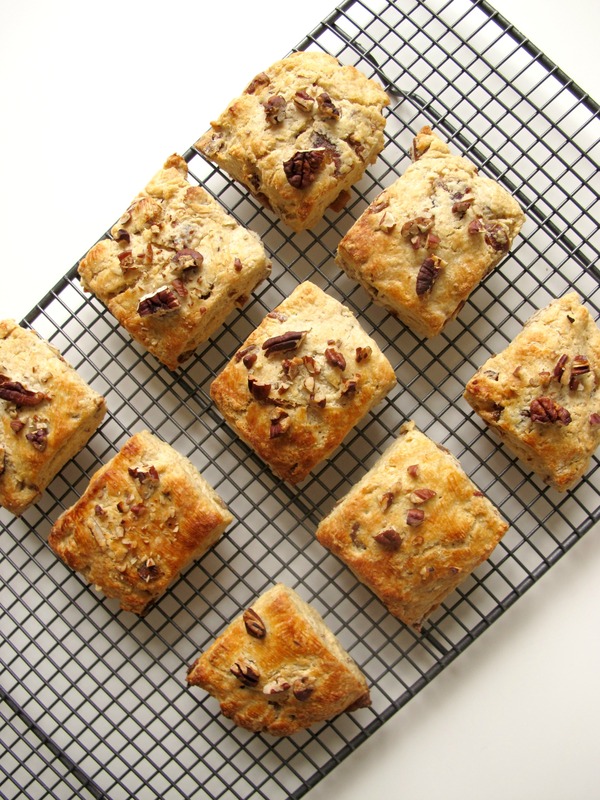 With half a carton of buttermilk, these sweet scones come together in a flash to create a lightly brown dough speckled with sticky dates and pecans. I patted into a square and cut into nine scones because it’s easiest. If you are a rolling pin and cutter kinda person go for it, but the nature of these scones are more rustic than perfect. 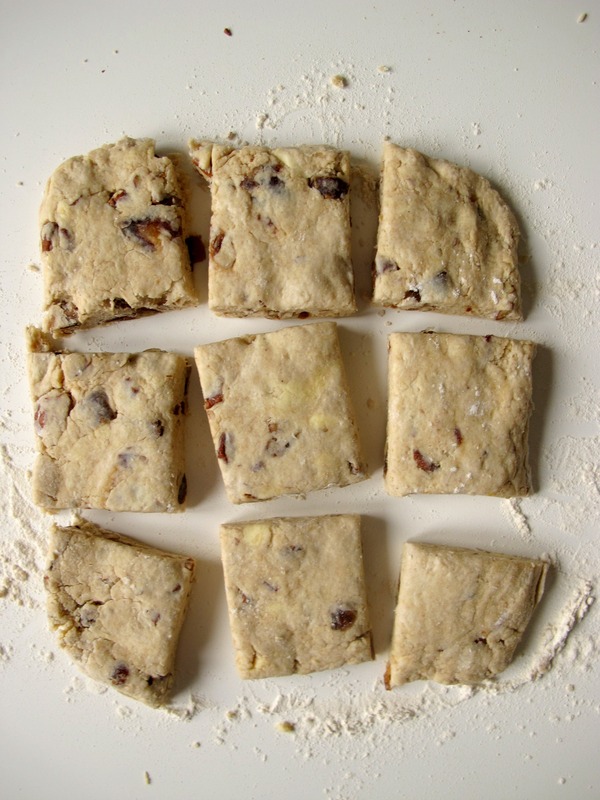 A quick brush of buttermilk and a smattering of chopped nuts send these scones off to the oven in style. In just 15 minutes you will have a warm plate of scones to take back to bed, coffee in hand and the February rain dripping down the window. It’s February, be frugal. Preheat an oven to 200oc/180oc and line or grease a baking sheet. 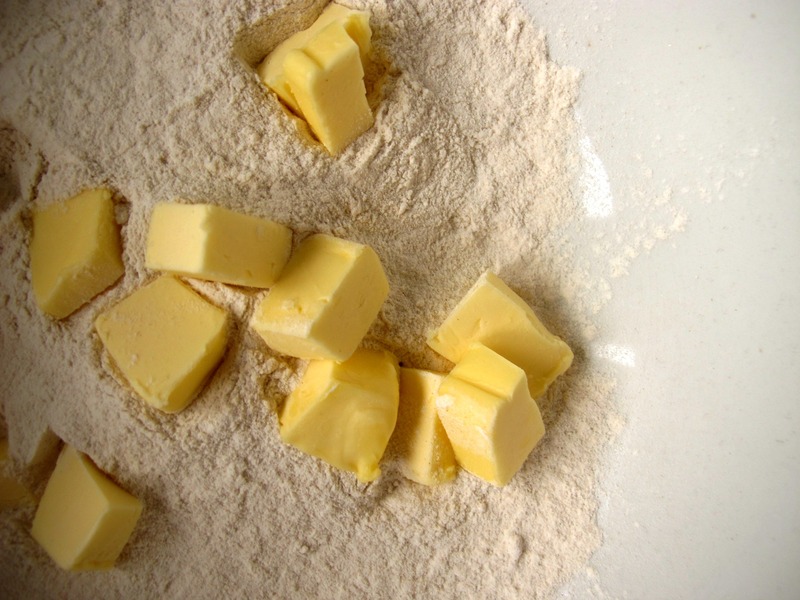 Place the flour and the butter in a large bowl and rub together, feeding the butter through your fingertips until the mix resembles breadcrumbs. 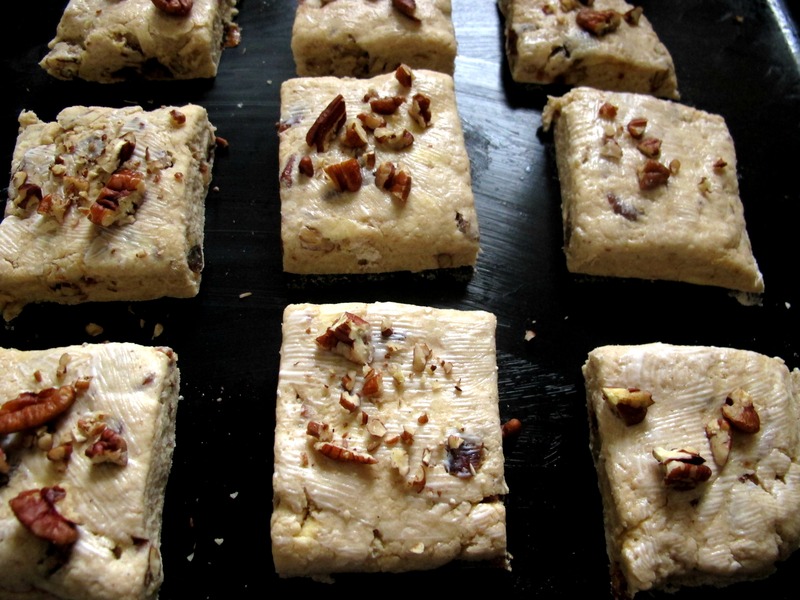 Stir through the sugar – you can do this with your hands – and add the pecans, reserving around a tablespoon’s worth to top the scones. Using kitchen scissors, snip the dates into chunky pieces and add to the bowl along with the nutmeg, giving the contents a good mix. Add the buttermilk and stir with a spoon then bring together to a shaggy dough with your hands. Tip the contents of the bowl onto a clean, floured surface and bring together gently with your hands. Pat into a square shape around 1.5cm thick and cut into nine squares using a sharp knife. Place the scones on the prepared tray and brush with the buttermilk from the container. Sprinkle over the reserved pecans and bake for around 13-15 minutes until golden. Leave to cool slightly then transfer to a wire rack, eating slightly warm with coffee. Lovely!! I hate waste as well! Buttermilk is always one of those things that seems to be leftover I my fridge. I’ll have to make these the meat time that happens! !